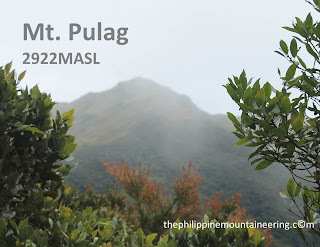 Mount Pulag (or Mount Pulog) is the third highest mountain in the Philippines. It is Luzon’s highest peak at 9,587 ft (2,922 meters above sea level). The borders between the provinces of Benguet, Ifugao, and Nueva Vizcaya meet at the mountain's peak. This heavenly mountain is the natural habitat of the endemic dwarf bamboo, (Yushania niitakayamensis) and the Benguet pine (Pinus insularis) which dominates the areas of Luzon tropical pine forests found on the mountainside. Philippine Deer, Giant Bushy-Tailed Cloud Rat, Long-Haired Fruit Bat and 33 bird species are some of the endangered species of the mountain. According to the claim of Mt. 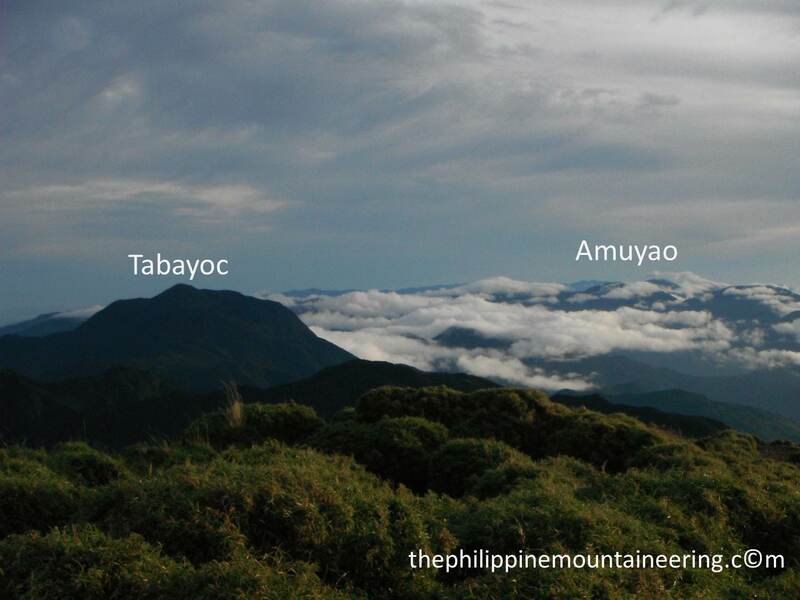 Pulog PASU, the said mountain "is the only place that hosts the 4 Cloud Rat species." On February 20, 1987, a large part of the mountain was designated as a National Park with Proclamation No. 75. This act aims to preserve the environment around the mountain due to threats from increased development such as conversion to agricultural lands, timber production, hunting, and increased tourism. As the highest mountain in Luzon, Mount Pulog attracts a lot of mountain climbers. The highlights of the climb include the montane forests and the grassland summit with its "sea of clouds" phenomenon. 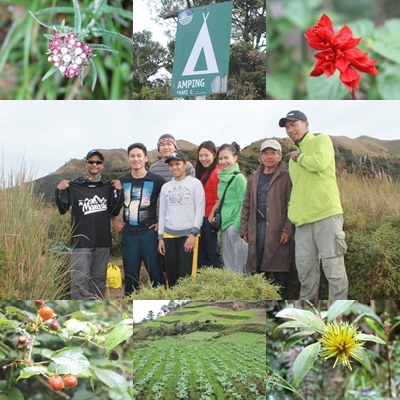 The mountain is under the management of the Mount Pulag National Park and DENR. The mountain possesses three kinds of vegetation varies according to the elevation. The Pine forest covers the 1200 MASL, mossy forest from 1300- 2200 MASL and the grass land covers from 2300 up to the summit. The indigenous people of Benguet like Ibalois, Kalanguya, Kankana-eys, Karao, Ifugaos consider the mountain to be a sacred place. Personally, it was never been my intention to climb Mt. Pulag for this year as my sign of personal protest against the trend of growing "milking cow" idea of jeepney operators towards the mountaineers. 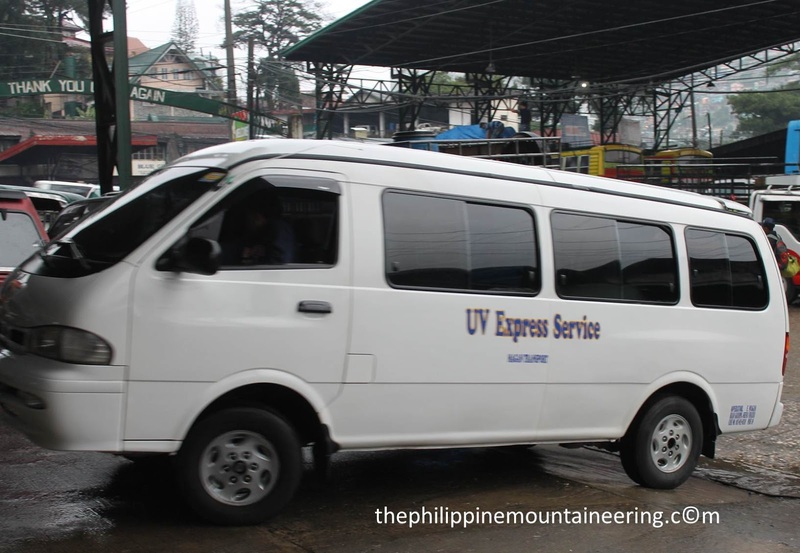 It's a known fact to the mountaineering community that the jeepney service for Mt. Pulag was unjust after the death of Kuya Roger, the known good driver. After his unresolved murder the sudden increase of Jeepney rate increased. Today, the major consideration of the mountaineers or mountaineering groups in climbing Pulag is not the trail, the difficulty or the weather but the heaven high jeepney charge. 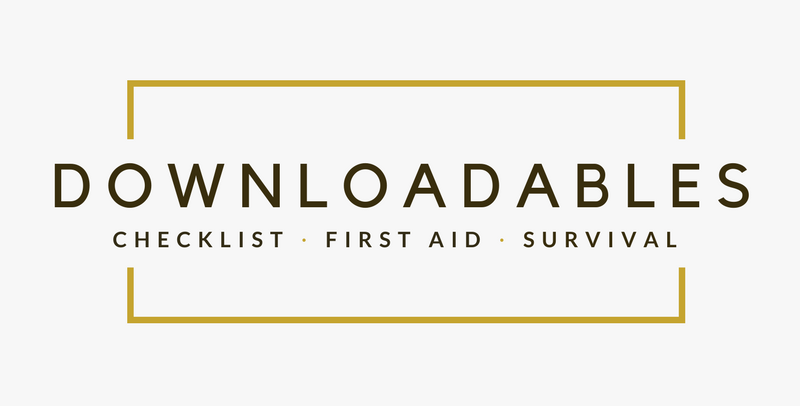 The intention of this blog post is to share our experience of using public utility vehicles. This might help you in your future planning if you're going to Pulag for a budget climb. The 16th of July was a long day for us, we spent the day inside Trinoma. That was also the time PAGASA declared storm signal number one to nearby provinces of Benguet like Ifugao with the typhoon name Isang. With the possibility of experiencing storm, we already made plans if Madam Emerita will send us SMS not to continue until 9:00 in the evening of that day. While inside Trinoma, we visited Base Kamp, to thank them for sponsoring the upcoming seminars by extending some signatured stuffs. Also within that day I personally met the General Manager of HABAGAT, Mr. Eduard. Despite heavy rain we continued with our plan to climb Mt. Pulag because there was no SMS from Madam Emerita. From Cubao we took the 10:30 pm trip to Baguio. The 5-hours travel was 5 hours of sleep for both of us. We reached Baguio City at 4:30, then immediately took our breakfast at Chowking Session Road. While having our breakfast we met two gentlemen and two ladies holding sleeping bags and tents and carrying their small backpacks. One of the group as me, if we are going to Pulag, and I said "yes" then one of the ladies said, "we want to climb that mountain but we really don't know how because we are waiting for our tour guide." I challenged them to climb using the easy trail of Ambangeg if they want to climb Mt. Pulag. According to my co-MCAPers Mtr. Jesus and Mtr. Shiela, the van going to Kabayan, Benguet is in Slaughter House Terminal. I also got the information that the first trip going to kabayan is 6:30 in the morning, but sorry for us at that day, we spent almost five hours waiting for the van. The van departed from Baguio City at 10:30 am, thanks to the store owner in front of the terminal who spent time talking to us, they are Ate Lyn and Kuya Romy. We also met two mountaineers who'll be climbing via Ambangeg trail. After almost three hours (with lunch stop-over) of zigzag travel we reached Bocod proper to get our two weeks old permit from the DENR office. As protocol of the DENR, Mtr. Ravi took seminar and orientation from Kuya Roy Tello because Madam Emerita was in Baguio at that time. From DENR office to Akiki jump-off, we took the 2:30 in the afternoon the bus from Baguio going to Kabayan because the Habal-habal drivers asked for 400-500 pesos per person. The bus fare from DENR to Akiki was thirty-five pesos only. After twenty-seven kilometers of bus ride we reached the Akiki jump-off at 4:00 (with snack stop-over) in the afternoon. Due to the on going road widening, the waiting shed and the sign posts were not available as landmarks. Due to previous heavy rain, the in-charge of Akiki Ranger Station did not expect that we will continue on our climb which resulted for him not to assign guide for us in advance. It was a waste of time waiting for the guide. The ranger station in charge came up to ask Sergio, Husband of Delma (their house is near the ranger station), to the guide until Edet River. From Ranger Station to Edet River campsite we walked for an hour and ten minutes. It was a good walk. Five kilometers walk from Akiki- Edet river campsite was an easy walk, while we are wearing our rainwears. 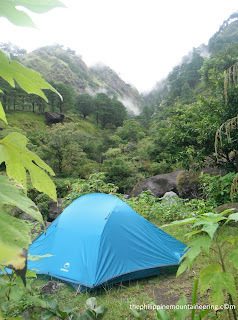 Upon reaching the Edet River campsite, we immediately encamp using the Apexus tent Halcon model. While cooking the dinner, our guide Sergio left us and instructed us to wait for our guide for the next two days. Heavy rain tested our tent, as expected, good quality Apexus tent gave enjoying and long time of sleep, from 9:00 pm- 6:30 am. On our second day we met the guide assigned to us, Selbino He is a younger brother of Teddy Aguinse the President of Guides and Porters Association of Akiki Trail. While we are preparing our breakfast and decamping, we oriented the guide regarding our purpose of climbing and also our concern with public transportation the following day wherein he told us that the last trip of bus going to Baguio City from Kabayan is 12:30 in the afternoon. That's why we targeted to reach DENR office of Bocod at around 10:00, so we have to leave at most 6:30 in the morning. At 8:15 in the morning, we departed from the Edet River campsite toward Camp 3 or the West Saddle campsite. Edet River is the last passable river going to the summit, wherein from the said river we experience uphill trekking, maybe some got the idea of calling Akiki Tail as "killer trail." After 55 minutes we reach the known e-camp, we stayed there for 25 minutes of picture takings. Then we departed from e-camp to Marlboro country after 45 minutes. We had our twenty minutes to enjoy the scenery of the known place of wild horses, but at that time we only saw cows and water buffaloes. The trekking experience with Mtr. Ravi was also a training. I learned to walk in small but continuous step. Even if our steps were bit smaller for my usual steps, we reached the last water source after an hour and ten minutes. Upon reaching the last water source, we prepared our packed lunch and there Selbino told us that we should get our drinking water from the water source because the water at camp 3 is not potable. For fifty minutes of rest stops, Mtr. Ravi gave important pointers on ski walking/ climbing and also with Acute Mountain Sickness (AMS). 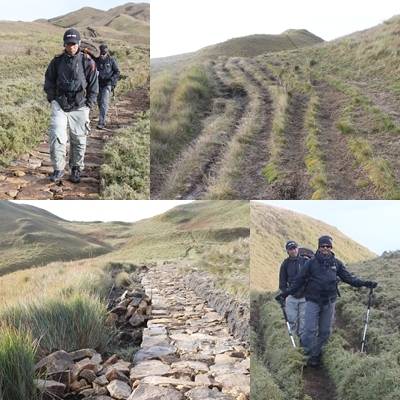 We departed the last water station at 12:40 in the afternoon and reached the start of the grassland area with estimated elevation of 2200 MASL. The view of Agno River from the grassland area reminded me the treasure of being part of the Agno River Trek 2013 wherein walked along the said river from Itogon, Benguet to Pangasinan province. The presence of dwarf bamboos and peanut grasses made the grassland area alluring to my eyes. The sixteen kilometers trek from Edet River campsite to camp 3 or the west saddle ended at 2:00 in the afternoon. Despite of Mt. Pulag's reputation as one of the most visited National Park we can still enjoy this mountain by visiting it in small group during weekdays. After few minutes of rest, we encamp using Apexus Halcon model. 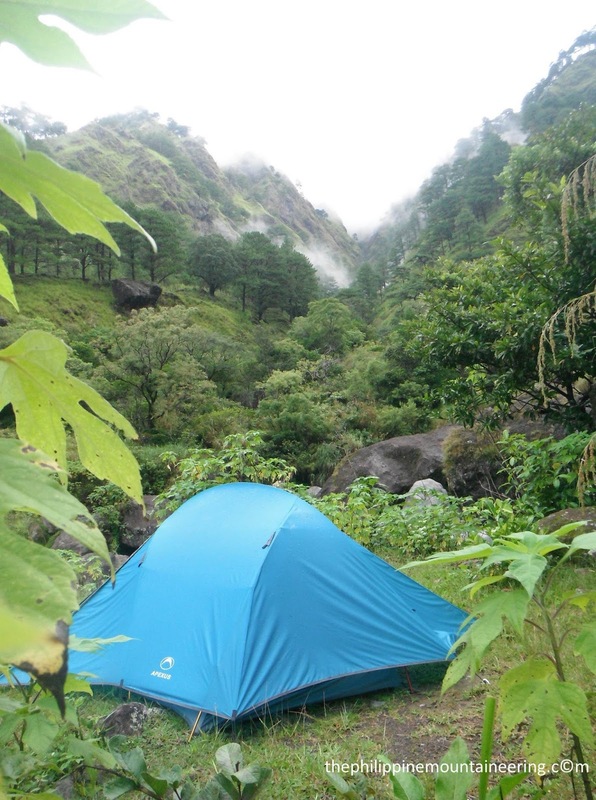 The blue color of our tent was so picturesque, it was with good contrast with brown colored grassland and nice rock formation. After more than three hours of sharing stories and shedding some joke we decided to go to the summit as per Mtr. Ravi's recommendation for us to enjoy our night sleep and also make make our assault the following day easier (acclimatization). After 20 minutes of walking, we reached the summit at 5:25 in the afternoon. It was zero visibility, we never witnessed the beauty of sunset at that time. After 15 minutes of stay at the summit, we prayed that the LORD will give us good weather for the next day and decided to descend. From summit to camp 3 it took us six minutes to descend. After our dinner, we finalized the next day itinerary because our concern is to get the bus going to Baguio from Kabayan at 12:30. Selbino gave us option of using "habal-habal" from Ambangeg Ranger Station to DENR. The 10-kilometer motorcycle drive according to him is 200 pesos per person. We set 4:00 as the wake-up time and summit assault with packs at 5:00 in the morning. The night of July 18th was so cold due to heavy rain. Mtr. Ravi didn't expect the coldness. Due to coldness and heavy rain, we woke-up at 5:20 and immediately decamp and prepared our breakfast. We departed camp 3 at 5:50 in the morning and after 15 minutes walking with our packs we reached the summit. After few minutes at the summit we saw six people descending towards camp 2 (East saddle camp site) of Ambangeg trail, they are probably 150 meters away from us. Truly, the beauty of the creation of the LORD was so amazing. From the summit we enjoyed the sea of clouds and the picturesque beauty of sunrise. From the summit we clearly saw the nearby prominent mountains like Mt. Tabayoc, Mt. Amuyao and Mt. Ugo. Through the use of binocular we also saw some part of Baguio City and also the prominent Halsema Hi-way. After an hour summit viewing and picture taking Mtr. Ravi asked for a prayer, one of his concerns was the vehicle going to Baguio City. After the prayer we started to descend. The less than two kilometers trail from summit to camp 2 (East saddle camp site)of Ambangeg trail is a clear evidence of irresponsibility of some or maybe most of the visitors of Mt. Pulag. We saw 8-12 race track like trail. There were a lot of indications of massive visits. Currently the DENR and local tourism office trying to solve the trail destruction by putting adobe rocks to the trail to make it more stable, but that form is not a solution, it's another problem. The trail condition of Mt. Pulag speaks for the fact that it should be free from mass climbing both from big mountaineering groups and unregistered undocumented tour operated visits. We reached camp 2 or the East saddle camp site at 8:25 in the morning. Mtr. Ravi and I were so happy seeing the group of OFWs we met in Baguio City. They told us that they were so challenged with our invitation that's why they decided to climb after a day. They also invited us to be with them going back to Baguio City because the five of them rented a jeepney. What a blessing! Upon hearing the invitation, I saw Mtr. Ravi being relieved from his vehicle problem. Our an hour of stay was so enjoying, there we cooked had our breakfast together and had a conversation with AMOS previous guide Tatay Andrew Bugnay. 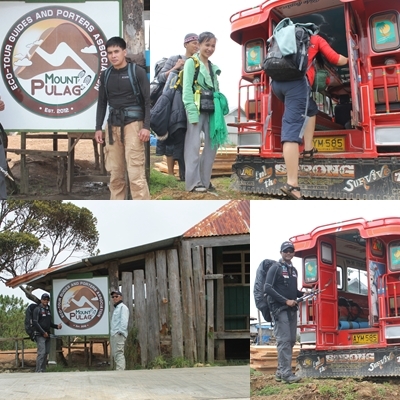 After two hours 7-kilometer walk-in-the-park from Camp 2, we reached the prominent Ambangeg Ranger Station. As we reached Ambangeg, I was so shocked with the "development" of the area. The rough road is now with two-lanes cemented road and even the Ranger Station will be renovated in the future. We were so blessed to be with the group of OFWs. Upon reaching the DENR after few minutes of drive, Mtr. Ravi and I bathed, while the five OFWs settling their climbs certificates and buying some memorabilia. The less than three hours zigzag jeepney ride from Bocod to Baguio City caused us trouble. Upon reaching Baguio City, we deposited our packs to the Police station along session road, for us to enjoy our Baguio Museum sidetrip. We also enjoyed the opportunity to dine to Baguio City's known vegetarian restaurant the Azotea Green. Go for Side trip- Kabayan, Benguet is the place of mummy caves and also there is National Museum branch there. Baguio City is the gateway of Mountain Province’s tourism, you can explore more mountains. - No permit no climb in Mt. Pulog. All permit should bear the signature Ms. Emerita Albas, the Park Superintendent of Mount Pulag National Park. All climbers are encouraged to set their climbs in advance. Beware of some individuals and tour guide agencies which offers possibility of breasting the summit of Mt. Pulog with the intention just to gain money even price is destruction of this sacerd mountain. Beware of individual/s now controlling/ monopolizing the jeepney services to Mt. Pulog. If you are really in need of jeepney service, as recommendation kindly ask Ms. Emerita Albas for assistance. Let us condemn together the current monopoly and unjust pricing of jeepney services. tanong lang po kung paano po makakuha ng permit?? at saan po?? salamat po! thanks for the question, the number of Ms. Emerita Albas is 09196315402.